Grigory Yavlinsky will not take part in Russia's presidential elections next March, and his party will not support Vladimir Putin. These were the results of a two-day post-election congress held by the Yabloko party at the weekend. For the first time in the history of Russia's oldest liberal party, the participants at its congress considered calling for a vote of no-confidence in veteran leader Yavlinsky, but only one-third of the delegates backed the initiative. In all 300 delegates from 75 of the country's regions took part in the 12th such congress held, by tradition, in the village of Moskovsky outside the capital. They had gathered to decide the fate of their party after it fell short of the five per cent minimum required to win seats on party lists in the parliamentary elections earlier this month. Despite that defeat the majority of delegates are still optimistic about the future of the party with long-standing leader Grigory Yavlinsky at its helm. One delegate told Gazeta.Ru that the issue was raised for the first time at the beginning of the session - 22 delegates voted in favour of including it in the agenda, with 197 opposing it. Taking the floor, Yavlinsky suggested listening to his report first of all, and then returning to the leadership question. The issue was raised a second time late on Saturday evening, after Yavlinsky had reported on the party's work during the election campaign and assessed the current situation in the country. 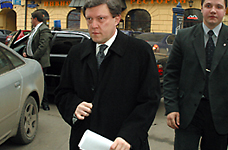 Again some of the delegates called for Yavlinsky's dismissal. According to Gazeta.Ru sources, the second discussion was initiated by deputy chairman of the party Sergei Ivanenko. This attack on Yavlinsky, too, failed, although as many as 67 delegates voted to include the issue on the agenda; 197 were resolutely against. The most important decision taken by the congress was its refusal to field a candidate in the presidential polls. The decision was passed by 134 votes to 23. At the same time, the party said it would not support President Putin in the race. ''It is pointless in conditions, when in order to nominate a candidate for the presidential elections and to receive financing for the campaign one must apply for permission to the officials in the [presidential] administration, taking part in the election, not to mention supporting the President,'' one Yabloko member told Gazeta.Ru, in a comment on the congress decision. In the two weeks since the parliamentary elections, Yabloko and the Union of Right-Wing Forces (SPS) held consultations on nominating a single candidate to represent Russia's democratic forces in the presidential campaign but failed to reach a compromise. Earlier, SPS suggested that it may call on its voters to boycott the presidential poll. If turnout falls below 50 percent, the result becomes invalid, the right-wing party said. Yavlinsky gave no indication at the congress whether his party would call for a boycott, saying that the decision on the issue would be made once the names of all the candidates have become known. have been delegated to work in the body, which is being set up by the two parties on a parity basis. The creation of the democratic council was suggested by the Union of Right-Wing Forces a week ago. They have already put six of their own representatives on the council, including three co-chairmen - Boris Nemtsov, Irina Khakamada and Yegor Gaidar. important priority. The resolution links the defeat sustained by the party at the recent Duma elections to ''unrestricted use of administrative resources and massive falsifications in the count''.